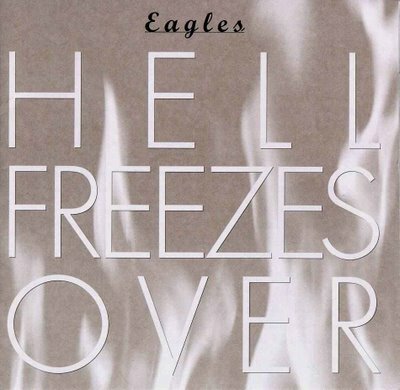 Although The Eagles broke up in 1980, fourteen years before they reunited for this record, they fortunately never really went away. At least not key men Glenn Frey and Don Henley. The two of them had pretty good solo careers during the entire decade of the 1980's. Actually, in Don Henley's case, replace the words "pretty good" with "damn near incredible". Let's be honest - when The Eagles were stars in the seventies, how many people even recognized the names Glenn Frey and/or Don Henley? Henley's solo career, alone, kept the band's memory and spirt alive throughout the time when they had "broken up". Then, you had this new kind of music pop up around the early 1990's that defined itself as "Young Country" that tried to distinguish itself from the George Jones and the Waylon Jennings crowd. Without belaboring a point, "Young Country" sounded a lot like mild Pop Music, the only differences being the artists had twangs in their vocals and instruments, and a lot of them wore cowboy hats. In other words, this new kind of music sounded a lot like The Eagles did in the seventies - xcept for that "cowboy hat" part. So even years before they reunited for this record, there were rumors that things were in the works. What many people don't realize is that a reunion of this magnitude is much easier said than done. There were contracts to get out of, commitments to make and break, and lawsuits. Lots of lawsuits. So everything was ready to go in 1994, but there were some who were a bit skeptical. O.K., so Frey and Henley were back, but who else? After all, there were a lot of players in the "Eagles History" program, and they all played a somewhat significant role in the history of the band during the particular time period that they were an Eagle. And if some, or all, came back, how would they sound? Well, the lineup ended up picking up right where it left off at the breakup. Which meant that it also included Joe Walsh, Don Felder and Timothy B. Schmidt. Older members Randy Meisner and Bernie Leadon were not invited back to the party. Rather than record an album filled with new tracks, they released this "half live / half studio" piece so the reunion could feel a bit more like a, well, ...."reunion." (there's actually about 3/4 live and only 1/4 new material, but we're splitting hairs here). This, in retrospect, was a great idea because they do a wonderful job covering both areas. For the "live" album part, they're in front of a much smaller venue and go through a nice selection of their hits and some other wonderful obscure material (Pretty Maids All in a Row, The Last Resort and Wasted Time are all here, each one from the acclaimed Hotel California). They sound just as wonderful and play just as they did from back in the heyday (probably better since they were, for the most part, getting along). The fact that it's a smaller audience shows this off a bit better. Playing in front of an arena (more like "stadium") would lose a lot of the musicianship and precision that they show off here so well. The only peculiar choice in the lot is (only) one solo song, Don Henley's New York Minute. It's done very well, but most would have rather heard an Eagle song instead. They include four new songs that are all extremely well done. Why four? I don't know. Maybe that's all they had time to write? Maybe they were the only "good songs" that they could write in the timeframe? Regardless, it works out quite well since it still leaves the CD with plenty of space for the above mentioned "favorites". Probably the best known of the four is the leadoff composition Get Over It. This was quite an ironic song. Ironic, because the message seems to be "stop bitching and whining about everything". Ironic because as successful as Don Henley had been during the last decade, he basically made his career out of bitching and whining - both on records and in the public eye. Even more ironic since it's Henley himself on the lead vocals. The other Don Henley track is one he cowrote with Stan Lynch called Learn to Be Still which was a much more thoughtful, introspective song. This sounds a lot like Henley's solo material, but who says that can't mean "Eagles material in the 90s" either? The Glenn Frey sung The Girl From Yesterday has more of the band's country signature attached to it. It's done well, but probably the least appealing. The real treat is Love Will Keep Us Alive. Timothy B. Schmidt sings lead on this one. If you know your Eagles history, you'll know that Schmidt only sang one Eagle song on only one Eagle album that was the only album he was on as an Eagle (that would be I Can't Tell You Why from The Long Run). So there's really not much to "compare" this song to, but the guys manage to make it a true "Eagles" classic that seems to capture the essence of their style as good as anything they've ever done. To support the album, the band when on a mammoth stadium tour throughout the world and managed to put on a killer show night after night. They basically picked up from where they left off fourteen years ago, but with new technology and internet access, more people were now aware of just how good these guys would be. I'm sure money had a lot to do with the reunion as well. Definitely one of the brighter spots in the history of rock and roll.